Liverpool manager Jurgen Klopp has indicated that Philippe Coutinho could start against Burnley this weekend. Klopp revealed that the wantaway Brazilian is in contention for a place in the starting lineup against the Clarets at Anfield on Saturday afternoon. 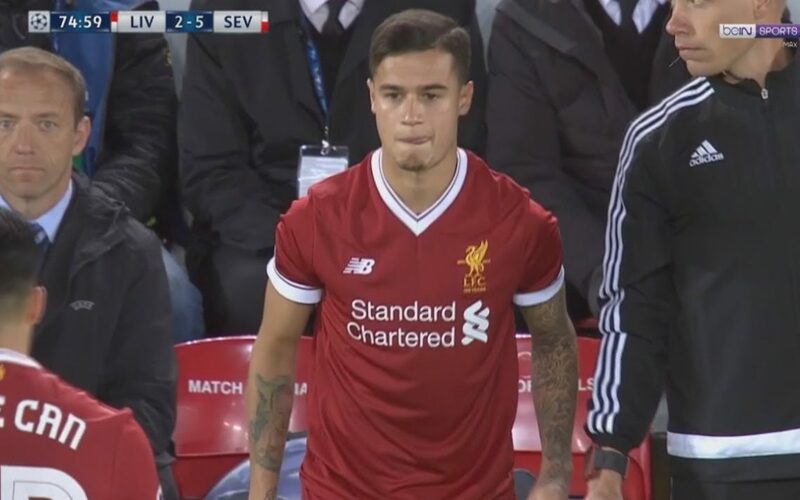 Coutinho made his comeback as a substitute in the 2-2 draw with Sevilla in the Champions League on Wednesday evening. He had previously been sidelined with a back injury, then a virus, and pushing for a transfer to Barcelona. Having seen his transfer request and multiple Barca bids rejected by the Liverpool hierarchy, Coutinho is now being reintegrated into Klopp’s squad. He could tick off another milestone by making his first start of the season tomorrow. Klopp told his pre-match press conference: “You can build up and get minutes when you start. “It’s not the moment where I talk about the line-up of tomorrow, but he should be ready. “It was really nice how the crowd welcomed him [against Sevilla]. Nobody was 100 per cent sure about this, but I am really happy that we were, as a Liverpool family, sensitive enough to do it exactly like this. I think it was good for him. “How I’ve said, he has trained outstanding in the few sessions we’ve had so far together since he was back. Coutinho played for 15 minutes against Sevilla and had put in a cameo appearance of a similar length for Brazil in their World Cup qualifier in Colombia the previous week.